The incidence of diabetes is on the rise worldwide and the complications of the disease represent one of the most challenging public health problems of the 21st Century. According to the latest fact sheet issued by the American Diabetes Association almost thirty million children and adults in the United States have Diabetes. There are many long-term complications from diabetes. It can contribute to the development of heart disease, stroke, kidney disease, eye problems, nerve impairment and medical issues in the lower extremities. An individual diagnosed with the disease will require a multidisciplinary group of healthcare professionals to manage and limit the complications of the disease. As experts on treating conditions of the foot, ankle, and related structures of the leg, a podiatrist will be an important and integral member of this medical team. There are two major causes for the serious foot problems in diabetics. The first is diabetic peripheral neuropathy, which can cause pain, tingling or loss of feeling in the lower extremities and feet. More than half of the people with diabetes experience mild to severe forms of neuropathy. As nerve damage to the feet progresses, numbness as well as susceptibility to ulcerations of the skin increases. 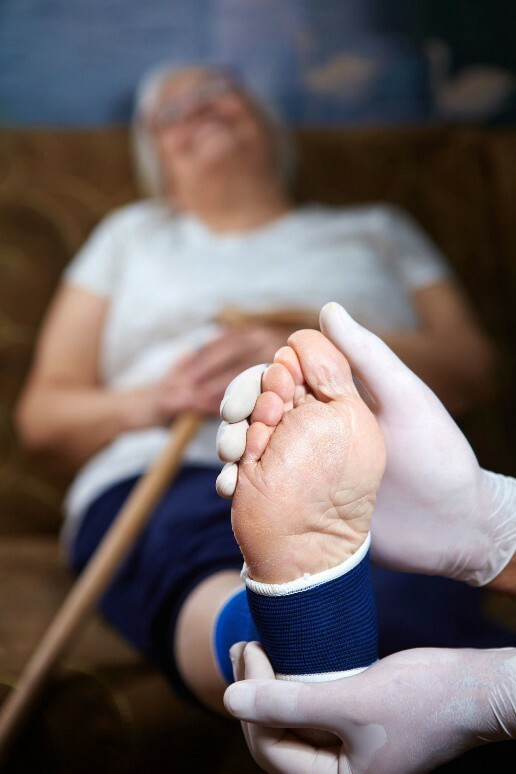 Due to the loss of sensation, an individual with diabetic neuropathy may not notice an injury to their foot until they have developed an infection. The second source of problems is peripheral arterial disease. This causes vascular damage and a decrease in blood flow to the lower extremities. Poor circulation to the feet means poor wound healing and the possibility for gangrene to develop. For people with diabetes even the smallest blister, sore, or cut on the foot can pose tremendous risks. Something as minor as an irritation from a small pebble in a shoe can quickly progress from a wound that doesn’t heal to a dangerous infection that can lead to an amputation and even a life-threatening situation. The statistics are alarming. Foot infections and their complications are the leading cause of hospitalization for diabetics. More than 60% of non-traumatic lower limb amputations occur in people with diabetes. 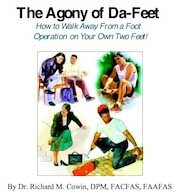 The keys to avoiding the foot related complications of the disease are the prevention and early detection of problems. If someone has diabetes it is extremely important that in addition to maintaining a healthy blood sugar level and healthy lifestyle, they practice a daily foot care regimen at home, and see a podiatrist for a thorough examination on a regular basis. A podiatrist will screen for the presence of diabetic neuropathy and vascular damage. They will check the foot and nearby structures for redness, swelling and non-healing wounds. A podiatrist will evaluate for ways to avoid foot ulceration or injury. They may recommend certain types of shoes or socks and even corrective surgery to reduce bony protuberances and deformities that can cause pressure and irritation. In cases of an existing cut or ulceration a podiatrist will provide the most appropriate wound care along with strategies to protect the foot from infection and accelerate the healing process. There are many things that a diabetic can do at home to protect the feet and prevent an injury. Inspecting the feet daily for cuts, bruises, cracks, blisters, redness, ulcers is extremely important. A small wound should be cleaned and dressed and checked frequently for healing. If anything appears out of the ordinary, the podiatrist should be called. It is recommended that a diabetic wash their feet daily in warm water and apply an approved moisturizer to the clean dry skin. This will prevent the build up of bacteria and provide protection from cracks in the skin that can harbor infection. Diabetics should also make sure their shoes fit well, are comfortable, and avoid going barefoot. Living with diabetes presents a challenge and foot complications are a constant risk. Being under the care of a podiatrist is the best way to avoid pain and problems. A diabetic should always keep in mind that good foot care is essential to overall health and well being.